So says Sr. Joan in this in-depth and powerful look at what our hearts can attain. She says that the ideas that fill our hearts determine the way we live our lives. Those are the things we draw on in those moments when we need to reach down deep inside ourselves for character, courage, endurance, and hope. 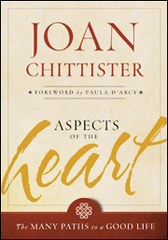 In this lovely book, Sr. Joan looks at 50 “aspects,” all of which in some way can fill our hearts and our lives. She talks about a prayerful heart, a peaceful heart, a risking heart, a wise heart, a cosmic heart, a compassionate heart. Each brief chapter offers abundant food for reflection and prayer, and each offers an opportunity to become persons who “produce good from the treasure of the heart” (Luke 6:45). Joan Chittister, a Benedictine nun, author and speaker, is a bold clear voice that shows the way to God in all aspects of life, and particularly through prayer. She is author of The Breath of the Soul, God’s Tender Mercy, and Songs of the Heart, also from Twenty-Third Publications.